Hey Everyone! With this lovely *speaking with sarcasm* cold weather, there is nothing like a good soup to warm you up! I love the good old traditional stew, but Chief Zoo Keeper gets tired of it so I thought I’d do something new. Try it out, you’ll love it!!! *feel free to add peas if you’d like, I think they’d go great! Saute onion until it is almost done then add in sausage and continue to saute. When sausage looks like it’s almost done, add in minced garlic. This whole process just takes about 5 minutes total. Pour in broth and turn burner, add water and tomatoes. Let come to a boil then add carrots. After about 5 minutes, add in squash/zuchini and macaroni. When macaroni is cooked through, you are ready to eat and enjoy! This sounds tasty! 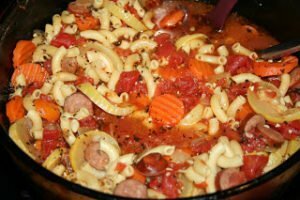 I’m a huge soup person – especially when the weather is cold. This looks good. I love soups! They warm you up and are very filling. This one looks great! Ooh! We love kielbasa! Will have to come back to this the next time we’re jonesing for it! Thanks for linking up with Moments of Genius! mmmm! it does look good! Soups are the best food, and this looks so good and hearty! I could eat soup every day. my famimly would love it all except the zucchini =) What a hearty looking meal! !